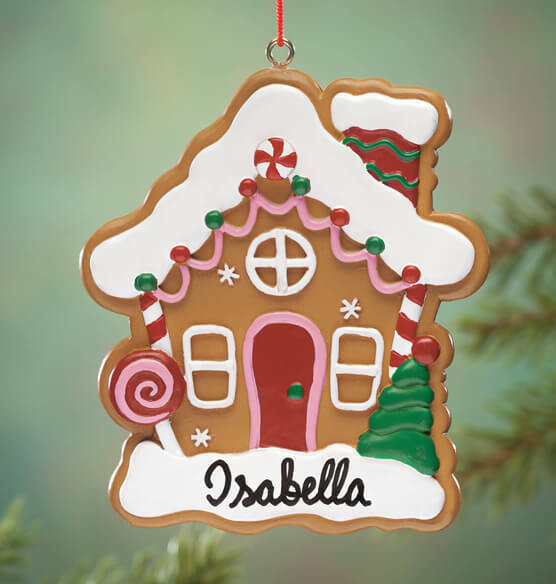 Inspiring sugarplum dreams for kids of all ages, our personalized gingerbread house ornament looks good enough to eat ... and it’s personalized for the ultimate treat. Beautifully detailed from gumdrops to lollipops and snowy white icing, this personalized Christmas ornament is a sweet keepsake treasure only found here. Specify name; limit 1 line, 12 letters/spaces. Resin. 3 1/8" long x 3 3/8" high. I have been buying Christmas ornaments from Miles Kimball for several years now for my grandkids. I have never been disappointed! They are of excellent quality and the personalization is lovely. I'll be back again next year.. It was very hard to find an ornament for my one year old grand daughter. This is not her first Christmas but she's too little for sports or dance. Not much is offered for this inbetween group. However, everyone likes cookies so I picked this gingerbread house for her. I needed something on the tree to represent our daughter-in-law. She has made a great home for our son and grandson so this was perfect. The size is nice and it is painted so nicely. I thought it was cute. Especially liked the pink accents.